Europe’s offshore wind industry has reached record record levels over the past year. According to some new numbers, an average of one turbine was erected each working day in 2012, coming in at a total of 293 new turbines across the continent. These installations brought grid-connected offshore turbines in Europe to a total of 1,662 across 55 wind farms. A total of 1.16GW of new capacity was added to the grid in 2012, bringing the total installed capacity to just under 5GW of power. 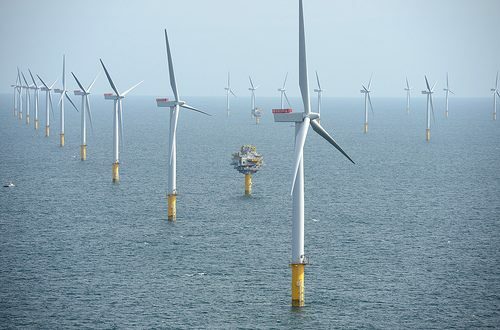 Fourteen offshore wind farms are already under construction for this next year. The UK is still dominating the market, responsible for nearly 60% of Europe’s offshore wind capacity; Denmark has 18%, Belgium 8%, and Germany 6%. While some European governments are throwing down roadblocks that prevent even more installation, particularly in France, which has several solid plans but zero installations thus far. Some countries may have to see the benefits others are receiving as a result of wind installations, which could cause a positive ripple effect all across the continent.